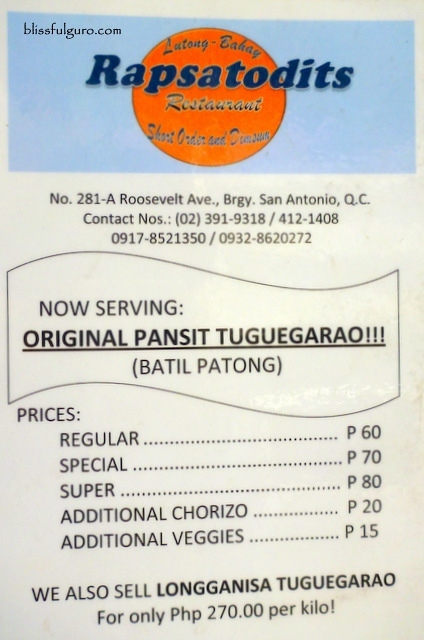 And the quest is still on for the next best Tuguegarao’sPancit Batil Patong in the metro. And luckily, me and my foodie buddy found one near my place - it's even just a jeepney ride away from work. 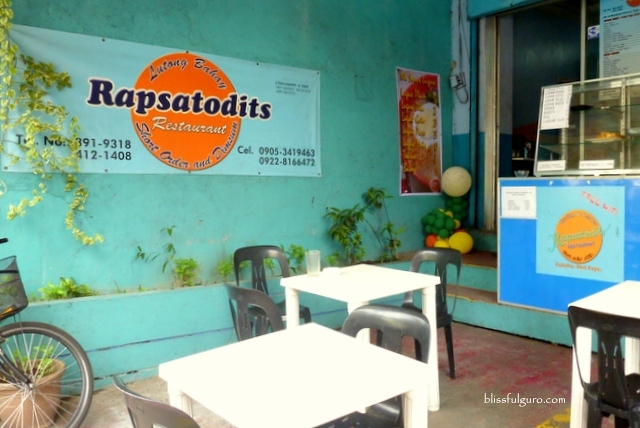 It’s the Rapsatodits Restaurant’s version of our latest food craving. 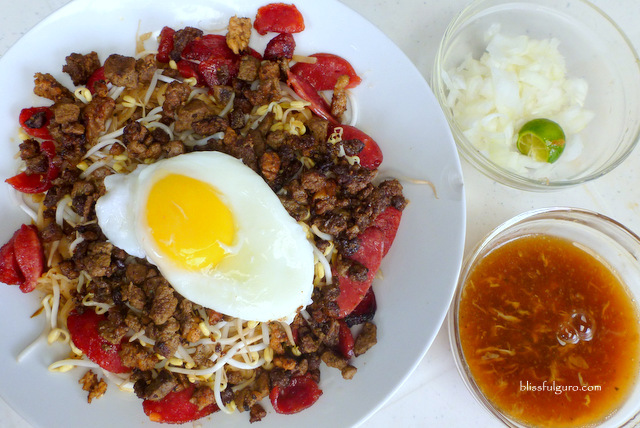 Searching for this modest eatery in Quezon City is easy. Coming from the main intersection of EDSA and Roosevelt Avenue (Muñoz) you can either walk west-bound or ride any Quiapo-bound jeepneys. 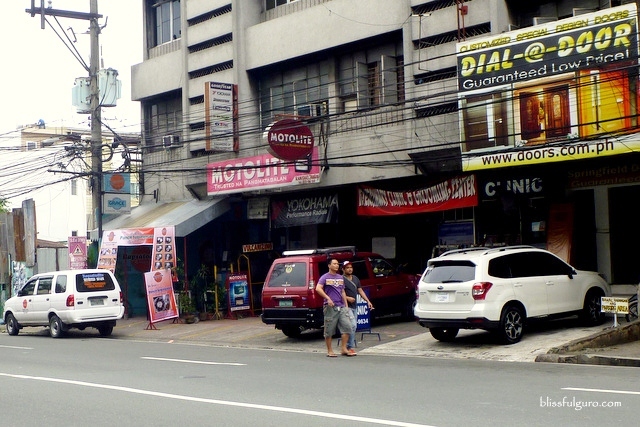 Watch out for the first Metrobank branch along Roosevelt Ave. on your right side. And just beside it is the building that houses the Rapsatodits Restaurant. 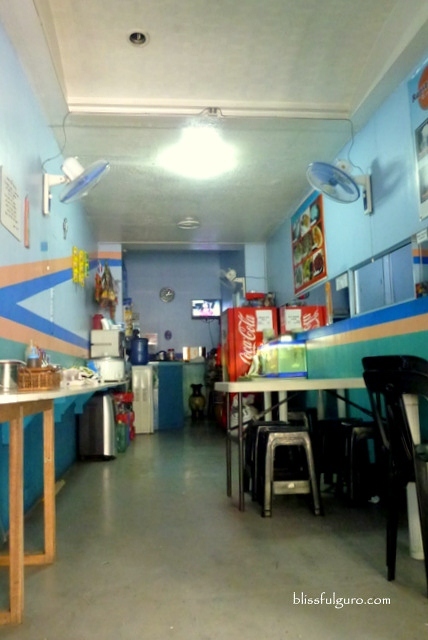 The eatery is just simple and unpretentious. We chose to dine outside the eatery alongside the tires from their neighbor-shop. Pollution wut?! It was late in the afternoon and we were so excited to get hold of our favorite pancit. The eatery offers a wide choice of all-day meals. 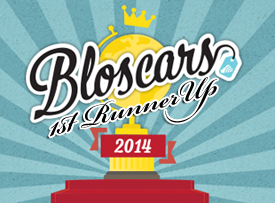 They have lugaws, silogs and other Pinoy favorites. 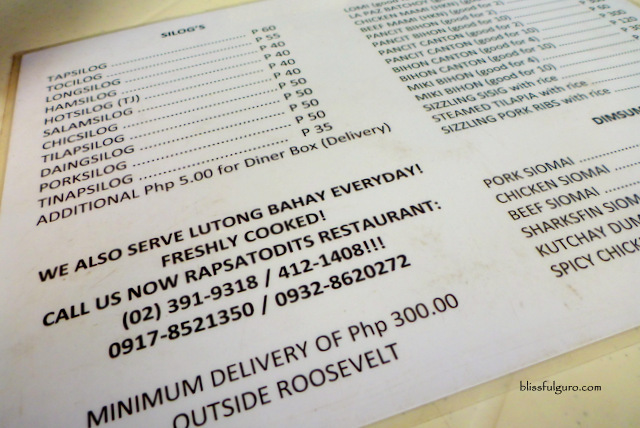 But as they claim, the house specialty is the Pancit Batil Patong from Tuguegarao; the sole reason why we were there. Another interesting item on the menu was the Longganisa Tuguegarao which wasn't available at that time. Sayang. We chose from three different sizes and we chose to have the huge one for sharing; the Super-size for 80 pesos. While waiting for our pancit, we chatted with one of the servers, Ryan. He’s a native of Tuguegarao and told us that he’s been currently training to be a soldier and wait tables to keep up with the city lifestyle. He also acts as the cook if the need arises or if you’d request for him (definitely our next plan). It didn’t take so much time for our order to be out of the kitchen. Their serving is not that huge compared to the other ones we had. One unique ingredient on their pancit was the bean sprouts (toge) which we found weird at first. We’ve also noticed that their version used chorizo rather than hotdogs. The soup (batil) was also darker than usual. After concocting the condiments of white onions and calamansi (and/or soy sauce), we both indulged. The verdict? It was good! I mean, the feel and taste were far from the original one we had in Tuguegarao but everything they added/replaced worked very well. The carabeef didn't have that maanggo taste at all and it was cooked perfectly. The chorizo added a distinct flavor that didn't overpower the whole thing. The bean sprouts (which we find weird at first) was great and added some texture to the whole dish. Gawd! I'm sounding and feeling like a legit food critic here eh? The pitfalls of their version were the supposedly poached egg (patong) and the soup (batil) which made a big difference to the whole experience. It was far from the original one. 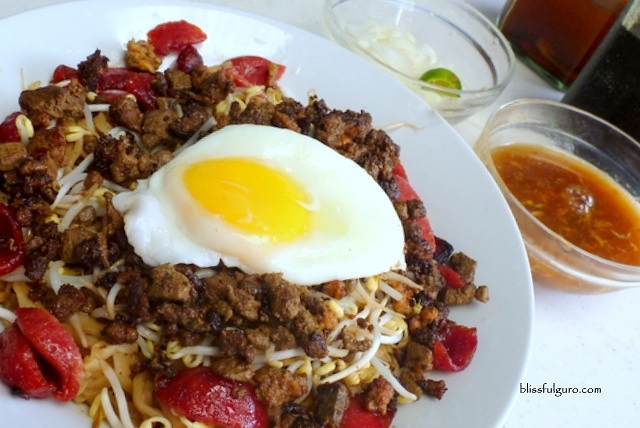 Rapsatodits Restaurant's version of the Pansit Batil Patong is yummy in its own right. 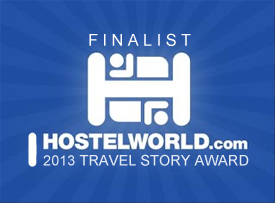 It may not be the most legit we've had, but it's distinctly good that we're so coming back for more. And maybe, we'll ask Ryan to cook next time too! But this definitely made our tummies and hearts happy. Hearts? Yes, hearts. For info po, we transfered to 84 sn antonio st cor sto nino, the street opposite eastwest bank beside BDO, 1st street on the left if your fronting the former place. Same tel numbers, 3919318, 4121408, 09178521350, & 09328620272.